“The Management of Savagery” excavates the real story behind America’s dealings with the world and shows how the extremist forces that now threaten peace across the globe are the inevitable flowering of America’s imperial designs. Washington’s secret funding of the mujahedin provoked the Russian invasion of Afghanistan in 1979. With guns and money, the United States has ever since sustained the extremists, including Osama Bin Laden, who have become its enemies. The Pentagon has trained and armed jihadist elements in Afghanistan, Syria, and Libya; it has launched military interventions to change regimes in the Middle East. These failed wars abroad have made the United States more vulnerable to both terrorism as well as native ultra-nationalism. The Trump presidency is the inevitable consequence of neoconservative imperialism in the post–Cold War age. Trump’s dealings in the Middle East are likely only to exacerbate the situation. Blumenthal’s book is a damning indictment of the bipartisan national security consensus and warning of its present danger to democracy. 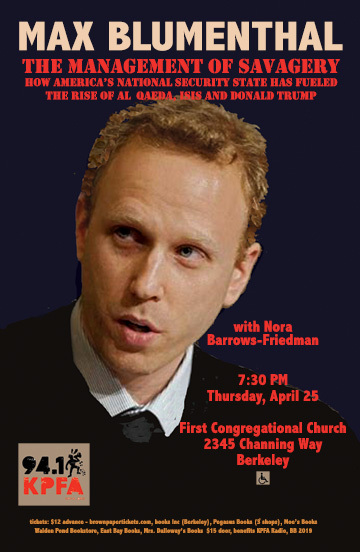 Max Blumenthal is an award-winning journalist and bestselling author whose articles and video documentaries have appeared in the New York Times, The Daily Beast, The Guardian, Huffington Post and Salon, Al Jazeera English and many other publications. He is Senior Editor of AlterNet’s Grayzone Project and the author of Goliath: Life and Loathing in Greater Israel, which won the 2014 Lannan Foundation Cultural Freedom Notable Book Award, the New York Time’s bestseller Republican Gomorrah: Inside the Movement that Shattered the Party, and The 51 Day War: Ruin and Resistance in Gaza. Host Nora Barrows-Friedman is a journalist, Electronic Intifada Associate Editor, autho of In Our Power: U.S. Students Organize for Justice in Palestine, and frequent KPFA Flashpoints’ guest.